Cooldelight Desserts are a specialist manufacture of ice cream and cold dessert products for the Cost & Public Sectors in general. Our range comprises of flavoured ice cream and cold-dessert products in both individual, insulated tubs for use in Education and Healthcare operations and in bulk 4 litre scooping tubs for the general Foodservice Market. Our specialist range also includes, Belgian Waffles, catering sized ice cream sponge rolls, individual, insulated tubs containing frozen mousse, frozen yogurt, iced smoothies vegetarian jelly tubs (thaw & serve), vegetarian swirled frozen mousse insulated tubs, vegetarian mousse and fruit crumble slices 40g (pre-portioned, slices), a new and unique concept for the UK Foodservice Market and the new range of individual trifles and cheesecakes (new for 2019). In addition, our portfolio now includes Ice Cream Sundaes (for children) and “low cost” Ice Lollies, including the new, Yes Fruit 12% Juice Ice Pops, suitable for use in all types of end-user catering operations, where menus are aimed at children, teenagers and young adults. 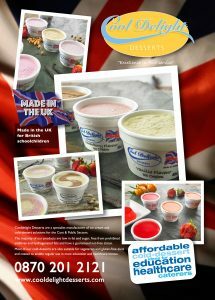 All our cold-dessert lines have specifications and pricepoints, suitable for regular use in Cost & Public Sector menus.